Natalie Diaz was born and raised in the Fort Mojave Indian Village in Needles, California, on the banks of the Colorado River. She is Mojave and an enrolled member of the Gila River Indian Tribe. Her first poetry collection, When My Brother Was an Aztec, was published by Copper Canyon Press. She is a Lannan Literary Fellow and a Native Arts Council Foundation Artist Fellow. In 2104, she was awarded a Bread Loaf Fellowship, the Holmes National Poetry Prize, a Hodder Fellowship, and a PEN/Civitella Ranieri Foundation Residency, as well as being awarded a US Artists Ford Fellowship. 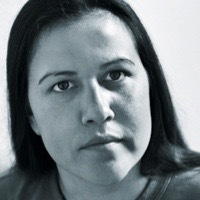 Diaz teaches at the Institute of American Indian Arts Low Rez MFA program and lives in Mohave Valley, Arizona, where she directs the Fort Mojave Language Recovery Program, working with the last remaining speakers at Fort Mojave to teach and revitalize the Mojave language.